I have lots of musical projects, including Santa Librada, Guided By Wire, 50'♀, The Degenerettes, and Flaming Creatures. You can buy my music at the links below. For upcoming show dates, visit my calendar. For booking requests, email me. 50'♀ contributed a recording of "Came So Far For Beauty" for this compilation of Cohen covers. Proceeds from the sales of this album all go to Planned Parenthood of Maryland. 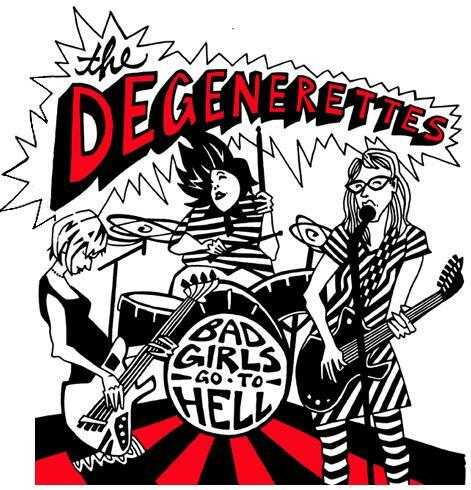 The second album from The Degenerettes, featuring an anthemic cover of the Velvet Undergound's "Candy Says" (featuring vocals from Katrina Ford of Celebration). The debut album from Baltimore's queer female garage pop power trio. Includes "Queer For You," as heard in the film Riot Acts.